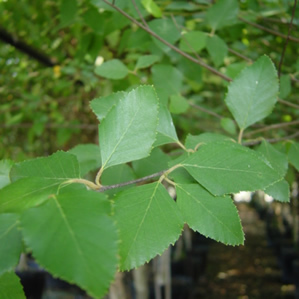 River Birch, grown mostly for the beauty of its peeling, satiny bark and salmon pink trunk, is a Texas Native. The Birch’s leaves are deltoid in shape and will turn yellow in the fall before dropping. Betula nigra has good flood tolerance and is often seen growing along river banks. River Birch does best on well drained acidic soils and will become chlorotic on high pH soils. The trunk can grow up to 30 inches in diameter and the tree itself can grow to be as tall as 30-50 feet, some have been know to even reach 90 feet in height. The River Birch is a fast growing tree and even though it can be as old as 30 years its best appearance is in the first 15-20 years. This is a Texas native plant!